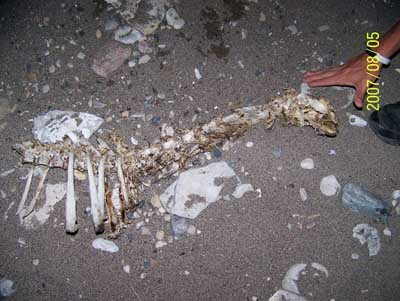 The following is a PSICAN two-page investigation report of an unknown animal skeleton found at Providence Bay, Manitoulin Island, ON, Canada – Investigation conducted by Dana-G Currie, PSICAN Cryptozoologist - Includes Photographs. Mr Ray St. Louis Jr., of North Bay, ON contacted PSICAN's Senior Cryptozoologist to report that he had located a strange carcass of an unidentifiable animal on a beach on Manitoulin Island, ON. PSICAN then assigned this investigation to the author of this article (Dana Currie) and the lead investigator for lake monster sightings for PSICAN. As the story goes, Mr Ray St. Louis Jr. was camping at a Tent & Trailer park in Providence Bay, Manitoulin Island in the Summer of 2007. On a clear and beautiful night, he and his family decided to go for a walk to look at the beautiful sunset accentuated by the majestic waters of Lake Huron. Mr Ray St. Louis Jr and his Fiancée walked along the shoreline for a little while, until his Fiancée’s knee was too sore, so, Mr Ray St. Louis Jr and his step-son walked on for a bit and then started their return. As they were walking they spoke with a couple they met along the way, who were from the Ottawa area. The man brought to Mr Ray St. Louis Jr’s attention a strange skeleton. Mr Ray St. Louis Jr’s stepson, who is learning to become a paediatrician at the University of Ottawa, thought it looked a bit strange as did the couple, who must have had some formal discipline in biology or veterinary medicine had made some very good remarks about the structure of this creature. At first glance, the couple from Ottawa believed that the remains were that of a small deer who may have drowned and was washed up onto the shore. However, the man showed Mr Ray St. Louis Jr that this could not be a deer due to the dorsal bones, which he indicated were primarily found only on aquatic animals. Also, the ribs were shaped very wide, long, and were close together indicating a narrow girth, not small, but narrow like the design of a fish. The animal also had a very long neck, which is why Mr Ray St. Louis Jr came to the conclusion of a deer. However, this man pointed out to Mr Ray St. Louis Jr that a deer had legs and therefore, there should be bone structures indicative of this, which were not present and was impossible for this to be a deer. This animal was too large to be a dog due to the sheer length of the neck, the rib formation (for lack of a better term), and the orbital sockets were very large and not proportional to a canine, deer, or any other type of fish or aquatic animal found in these parts. There was evidence that this creature had no legs at all (front or hind). This person also indicated something about the number of spinal vertebrae. Mr Ray St. Louis Jr. wished that he could remember this part, but by this point he was so amazed that he forgot exactly what the gentleman had remarked. Mr Ray St. Louis Jr. felt that the photos were clear enough for a Doctor of Veterinarian Medicine to assess this. The man had said something about the number of discs not being normal for known (documented) creatures. As Mr Ray St. Louis Jr continued examining this creature, he started to realize that this was indeed a creature not native to these parts and, to this day, he is perplexed by what this was. He is not saying that it is a baby Nessie but he said he was sure of what it was not. It was not a muskrat, a beaver, a deer, any type of fish, a dog, and not a bird; so, he sought help in identifying the creature. Mr Ray St.Louis, Jr felt that the carcass was only a few days old at most because there were some parts missing and there appeared to be some flesh still being eaten by insects. Primarily, its back end was totally gone, which was most unfortunate, because this would have spoken volumes. Mr Ray St.Louis, Jr. would have taken the skeleton with him but he did not have anything to put it in and he was not really anxious to put it in the trunk of his car along with their gear. Mr Ray St.Louis, Jr provided many images of the skeleton found on the beach but to large amount of computer storage space required, the author/investigator has only provided what are felt to be the best of these images. Image 1 below is of the body of the unknown creature and image 2 on page 2 is the head area of the unknown creature.